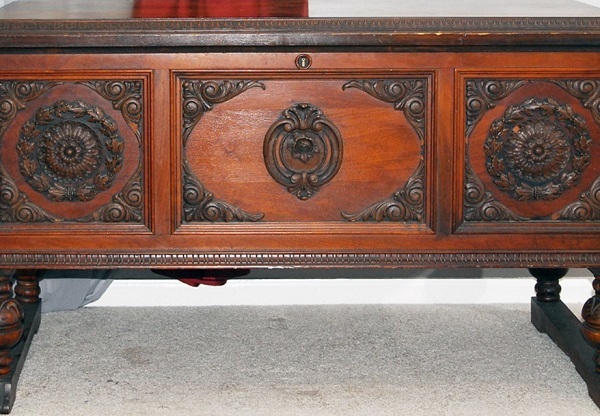 Finding a gorgeous handcrafted cider chest that was made before the 20th century, would be a lucky find indeed. Anyone fortunate enough to come across such a rare piece, could easily expect it to fetch a price tag that’s in the thousands of dollars. 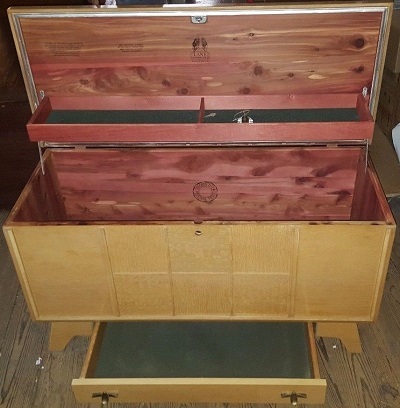 Most cedar chests on the market however, were made no earlier than the 20th century, and were not handmade but were instead machine produced in a factory.Finding reliable information on pre-twentieth produced cedar chests is hard to come by. One way to try and help narrow down the era, would be to look at the craftsmanship used to assemble the piece. A machine produced piece, would have clean lined and flush finished dovetail joints. While a hand crafted piece would have more roughly cut and uneven dovetail joints. During the 1900’s there were two main competing companies that were producing cedar chests. The Lane Furniture Company and the Ed Roos Company of Forest Park. Both of whom produced their designs in bulk, and both still having some rare designs that carry value among collectors today. Established in 1912 in Virginia, the Lane Furniture Company began production of their cedar chests in 1920, and would continue production until their factory was closed down in 2001. Along side their cedar chest, the company produced television cabinets and occasional furniture during the 1950’s. From the 1960’s-1970’s, they expanded into bedroom furniture and recliners and maintained production until they filed for bankruptcy in 2014. Lane Furniture had a rather unique serial number method that also indicates the date the piece was manufactured. A serial number such as “2865110”, also indicates that the production date for this piece was January 15th 1968. We get this information by reading the serial number from right to left which gives us the date “01-15-68”. The first number shown, or seventh if reading for the date, is an additional number that may be present. If it is present, like this it is in this example, it indicates which factory that piece was manufacturer in, in this case site “2”. There are exceptions to this serial numbering method, as there are some rare finds that are read from left to right. So if the date does not make sense when read right to left, try reading it left to right, you just might be in for a surprise. Another potential indicator of age, assuming it has not been replaced, is with the locking mechanism. 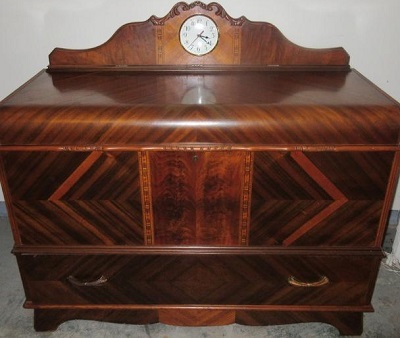 Chests made prior to 1987 had lids that would automatically latch shut when closed. This meant that if a child was to hide inside one of these chests and close the lid, they could lock themselves inside and risked potentially suffocating themselves. As such, chest made after 1987 had replaced this locking system, with safety locks instead. Originally known as the Roos Manufacturing Co. that was situated in Chicago, was established in 1871 by Edward Roos. A German born immigrant that migrated to the US from Sweden in 1848. They began by producing curtain rods and wooden boxes. Following his death in 1906, his company was taken over by his eldest son Otto. It is unclear which year they began the production of their cedar chests, but by 1916 the youngest son Edwards, created the Roos Cedar Chest Company, before changing the name to Ed Roos Company of Forest Park in 1918. Both companies had marks that indicated which factory the cedar chests were manufactured in. As there was an overlapping period where both companies were producing cedar chests prior to 1918. The Roos Manufacturing Co. added “Original” to their mark for the chests that they produced between 1916 to 1918, at which point the Ed Roos Co. of Forest Park became their main producer for cider chests. Keep in mind that these were not the only variations of their marks. As Roos Manufacturing had marks with and without the rooster, just as Ed Roos Co. marks may have a tree, no tree, or in the case of their sweetheart range, a love heart. By 1930 Ed Roos Co. had reached its peak production period and became the largest chest manufacture in the world, employing 400 people, and using three million feet of timber a year. Following Edward Roos death in 1943, and the government restrictions placed upon the company during World War 2. The company fell on hard times and was sold off in 1951, only to be closed four years later in 1955. There use to be an old custom where a young girl was given a “Hope Chest” in which to store linens and other household items, in preparation for the day that she was to marry. For hundreds of years, newly weds would continue to use these cedar chests to store items that were susceptible to being damaged or destroyed by moths. By storing linens, blankets, fabrics and papers in these chests. The owners were able to prevent moths from eating their possessions, as the cedar wood contains an aromatic oil that repels moths and other insects. Cedar chests also had many practical uses besides storage. Aside from storing guest blankets and pillows, they could also be used as coffee tables and footrest, seats and low benches. Many people would also use them to store bulky household items, toys, games and equipment. They fell out of popularity however as we found other ways of managing months. Thanks to climate control technology improving, and with the introduction of better pest control, we are able to keep moths away from our possessions much more easily. This means that household cedar wood based products that repel insects are no longer as sort after as they once was. Another cause for their decline in popularity, is that most homes now have built in linen closets and less floor space. A bulky floor chest is likely to get in the way in many homes, and given that most linen closets can store more items then the average chest can. They have since lost their storage appeal. Cedar wood contains oil that will stain and discolor most fabrics that come in contact with it, especially if its for extended periods of time. For this reason it is advisable to make sure that the outside of the chest has been properly sealed with a sealing finish. If there is a risk that the feet or base of the chest may stain the surface that it rests upon. Use a physical separator or furniture sliders to help prevent contact with the surface area. To prevent the staining of items stored inside the chests, make sure that inside of the chest is lined with a mylar or polyethylene sheeting. Provide additional protection by wrapping fabrics in white cotton or washed unbleached muslin sheets, and store papers in none porous containers such as glass jars, or metal and plastic boxes. Avoid using cardboard to line the inside of the chests as it will absorb and retain the oil from the wood. If you have gotten your hands on an old cedar chest, but you don’ have access to the original key. There is no point in trying to force the lock yourself. If done incorrectly, not only could you break the lock, you might cause damage to the chest, or cause yourself an injury. Just take the chest to your local locksmith or antiques dealer instead. The truth is that there are no replacement keys for these old locks. You might get lucky and find a key that’s a near match from your local antiques dealer. But more then likely you will need to use a locksmith to open it for you. They will be able to get it open in about five minutes tops, and can even replace the lock so that you have a functioning key from now on. Some locksmiths may even have replica keys in stock that they might be able to modify to function in your lock. It never hurts to ask around, just in case. Just as with most furniture, it is best to use the correct cleaning method that is suitable for the timber’s finish. If the wood is sealed and polished, then most furniture polishes should work fine. Just make sure that the chemicals in the cleaning agent won’t dissolve the finish that’s on your chest. Other wise warm soapy water will work just as good. Do not soak the chest or use a wet cloth to clean the wood. Wring out a soft cloth so that it is damp, not wet and gently wipe down the surface. Make sure to quickly dry of any water streaks that may be left behind as this could cause water staining. Perform regular dusting and keep the surface of the wood away from any hard or edged objects that could cause contact damage. Little things likes keys, belts and boots can cause dents and scratches to appear. If the chest is going to be kept in a high traffic area keep it covered and protected from impact. A simple cloth or a custom made padding, that can function as a cushion would be better then leaving the chest bare and exposed to everyday wear and tear.